Katsukawa Shuntei (1770 1820) Portrait of a Samurai with Giant Axe, 1810's. Oban. A fine and important early warrior print from a rare artist, Katsukawa Shuntei. In some respects, it is right that Kuniyoshi should be remembered for the single sheet warrior print - a genre that he made his own in the nineteenth century. Kuniyoshi published The 108 Heroes of the Popular Suikoden in 1827. Possibly Kuniyoshi’s finest and most important series, these prints burst onto the woodblock scene with their bold colours, exotic settings and richly decorated surfaces. He pictured the heroes as having superhuman strength, richly tattooed and engaging with supernatural creatures. There were precedents to this seemingly revolutionary set. Kunisada produced single sheet warrior prints in the early 1820’s and more influentially, so did Shuntei, as this very fine early warrior print demonstrates. 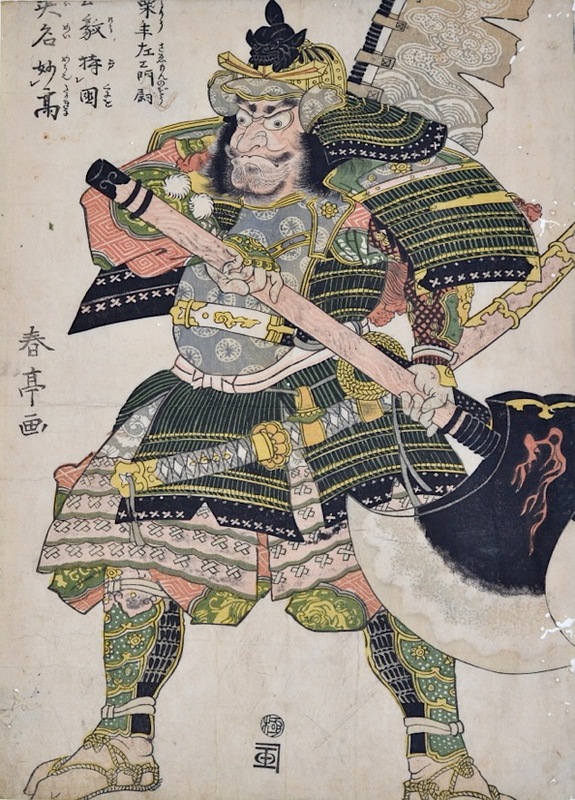 Shuntei shows a Samurai (possibly Awate Saemon) in an aggressive stance wielding an unfeasibly large axe. The influence on Kuniyoshi is evident in the exaggerated grimace of the figure, as is the drama of the scene and the boldness of the approach - Shuntei, like Kuniyoshi after him allows the figure to fill the entire page, the flag on his back and the edge of the axe literally spilling out of the page. The colour is remarkably well preserved for the era and and the impression is very crisp and very fine. The condition is very good, there are some small worm holes to the right edge and some soiling but these are quite minor. I can find no other record of this print.